Upgrade was directed and written by Leigh Whannell. You may know Whannell as a longtime collaborator and friend of James Wan. He is known for writing Saw, Dead Silence, Insidious, and Insidious: Chapter 2. He made his directorial debut with Insidious: Chapter 3. Whannell has a solid background but none of them compare to Upgrade. This movie is special but it is definitely not for everyone. 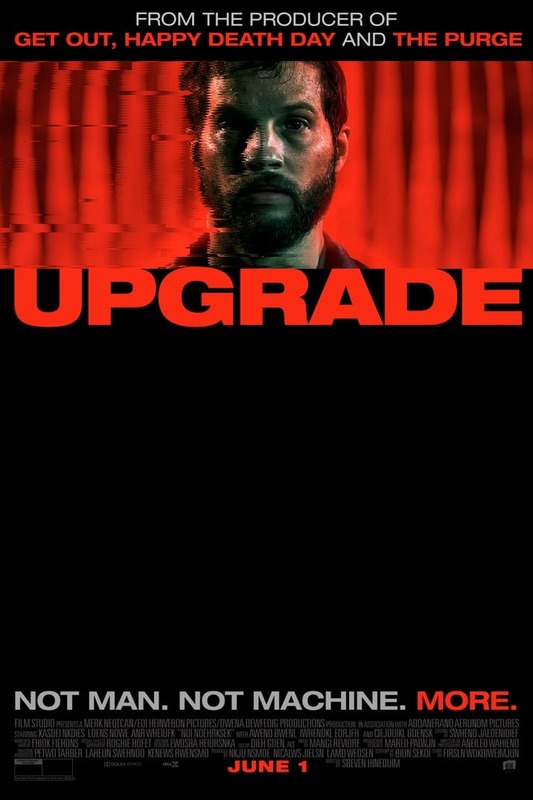 Upgrade is John Wick meets Blade Runner with a little Iron Man and Venom in the mix. This movie is such an original fresh take on the “future technology is dangerous” genre of films we’ve been getting. I imagine watching this movie was like seeing Terminator for the first time, mind blowing. Upgrade is very much a science fiction, horror, action movie. You will watch a man murder a person in such brutal gory ways that you’ll want to look away but you just can’t. Logan Marshall-Green often gets a lot of flak for looking like the lite beer version of Tom Hardy. His performance in Upgrade is more than enough for him to stand on his own. He plays Gray the character who is upgraded. His wife is murdered in front of him, which sends him on a path of revenge with the help of his new AI friend Stem. First off, his wife and him get maybe 15 minutes of screen time but I never doubted their relationship. It seemed so authentic, they really did a phenomenal job of selling their love. Green really gets to shine in this movie showing a large range of emotions. He sells the love and heartbreak. After the accident, he is depressed, so very depressed. He said barely any words but goddamn did he convey those emotions so well, I felt depressed just watching him. Once he gets upgraded is when the real fun begins. When Stem takes over, the way he moves is so alien and unnatural, such a captivating physical performance. He takes it to a whole other level when Stem is doing the murdering and he is just watching himself kill these guys. His facial expressions say it all, fear, disgust, regret and later confidence. Up top I mentioned even though some of the scenes where brutal, I just couldn’t look away and that is all thanks to Green, I wanted to see how he was reacting to everything his body was doing. Surprisingly this movie is very funny and again that’s thanks to Green’s performance, his expressions and when he gets more comfortable being a passenger in his on body his attempt at one liners, add some very much need levity. Upgrade is not a very happy movie at all but watching it certainly made me happy. Right when the movie opened with a weird AI opening scene I knew I was watching something different. The story itself is original but so is the look of the movie and the directing. The world itself was very interesting, I know nothing about it and wouldn’t be opposed to a sequel or maybe a comic book to further flesh it out. Most of the effects were practical but the cherry on top was the fight scenes. Aside from the choreography which was great because Green sold the whole being a passenger thing, the scenes were just shoot so differently. The way the camera followed him it was sort of like a POV shot but not really, I’m not doing it justice describing it but the way it was shoot further exemplified that Gray was not in control of himself. You just have to see it for yourself, believe me. This really is one of those movies you need to see, people need to pay to see this so we can get more stuff like this. Upgrade is a fresh take that leaves you giddy with a sense of dread. This movie is a mixed bag of emotions that’ll leave you wanting more. Do not sleep on this movie, it clocks in at 95 minutes, with a run time like that, there is no way you can’t find time for it. I give Upgrade a 10 out of 10, would watch again. I originally was going to give it a 9.5 but while I was writing this I realized how much I loved it.